A few years ago, I wrote a blog post about timing. I’m sure no-one remembers it. To be fair, I only remember it because, recently it came up on the list of posts made on this day each year. Well, this will be my second post about timing. Bad timing. 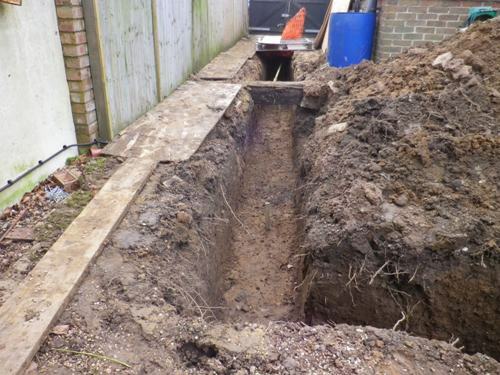 Today, Paul and the older guy and an even older, older guy (I have no idea what happened to the younger guy…unless they left him in the skip before filling it) turned up and joined up the trenches, cleaned them up and put markers for the footings. By the end of the day, it, somehow, looked better than yesterday. I think it’s because the two trenches are now one and the cleaning up of the edges and baulks (very much like we do on digs before photography) was in preparation for the concreting tomorrow. Though, by the end of the day, it was made apparent to us that the concrete would NOT be arriving tomorrow. Due to a “…miss-communication…” it is now coming Monday morning. I really hope it doesn’t rain over the weekend. This morning, when I went shopping, I locked the girls behind the improved Day-z proof Heras fencing. When I returned, they were a bit pleased to see me: I was pleased to see them both still in there. I thought they needed a walk for being so good. We went up to the park. We hadn’t been to the castle for ages (and they’ve been doing work up there all week which I’ve not been able to see) so, after consulting with Carmen, I thought it only right that we went today. 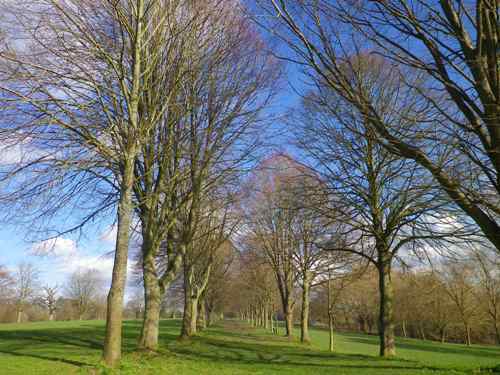 It was a bit chillier than I’d really dressed for but, even so, the winter sun was on full show, bathing the trees in sunbeams. Up at the castle, some ranger type guys were having a break, around a camp fire made from some of the scrub they’d dug out of the ditch surrounding it. And they’d cleared a lot! I could clearly see the wall where once there’d been none. I remember when I spoke to the gardener who was a mason, when he was repairing the outside wall and he told me they had money earmarked for clearing the ditch. I guess it’s happening now. It’s certainly looking good. Turning my back on the castle, we started to retrace our steps when the Avenue of Trees brought me up short. Back at home, the guys had been busy making the back garden even more decimated while cleaning up the side. And, so, you ask, what has that to do with timing? Simple. Because they were digging a trench which has now effectively created a moat around the house, I can only cross it when it’s convenient. It was not convenient for large swathes of today. When I was in the house, I wanted to be in the office and vice versa and, of course, they were, at that time, inaccessible. Most annoying. Still, I managed to do a lot of housework. 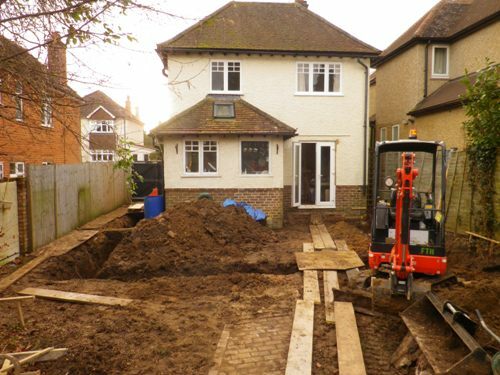 This entry was posted in Gary's Posts and tagged builders, castle, extension, Farnham Park, poodles. Bookmark the permalink. Oh my goodness be good when you have gone to the holiday let. I wrote the bloody book!